I did mention several posts ago that I am currently suffering from plantar fasciitis and creaking knees. And man, the former has been taking months to heal. It was annoying in the first few months (I’d wake up limping in the morning due to pain), but by December (coincidentally the month I pigged out) the pain had become extremely unbearable. By that time, both my feet would be in excruciating pain upon waking up. For this post, I will be talking about how I lost 13 pounds in a span of 3 weeks. I’ll save the shoes for Part II. You’ll notice from the photos above how my jawline disappeared as the year progressed? LOL. 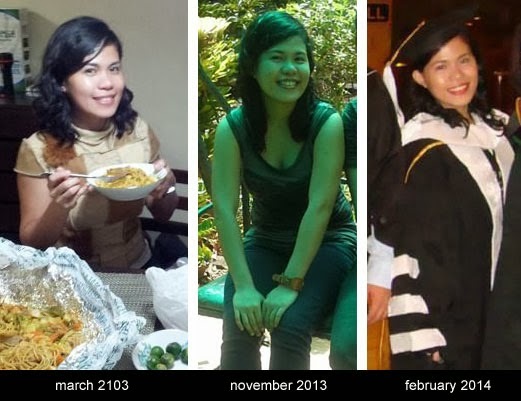 Photo on the extreme right was my most recent picture (during my students’ graduation), after I got my jawline back. Before anything else, I would like to remind readers that you need to see a nutritionist before going into any sort of diet plans. Anyway, in summary: Everyday is cheat day except for 2 non-consecutive days in the week when a woman eats only a total of 500 calories (600 for men). One of my “Fast Day” survival tools. I actually failed miserably in my first two weeks attempting this fasting thing. The failure was so bad that the words “Korean barbecue” had suddenly taken on a cannibalistic, literal meaning for me. Long story short, in my first two fast days, I ended up so hungry that I ate too much in the evenings. That was when I realized that I cannot do what most people on 5:2 did. I cannot fast with only two meals a day. That was bad for my ulcer. I also cannot fast more than once a week. So I checked if 6:1 would be a better alternative to 5:2. Unfortunately, 6:1 was supposed to maintain your current weight, not shed pounds. 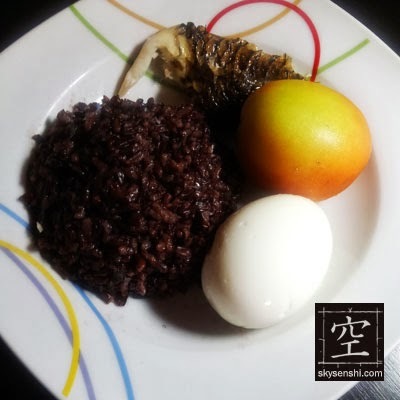 So I ended up doing a bit more research and decided that during my regular days, I would pig out on protein and carbs that had low glycemic index (diabetic-friendly) like wheat bread and black rice. These are high in calories but don’t retain much water. In my first week of eating low GI carbs (no fasting yet), I went down from my Christmas weight of 123 lbs to 118 lbs. All of it was water weight. Next, I worked on shedding the remaining difficult weight. Without resetting my metabolism, I really stopped at 117-118 lbs. So I decided to go into the 6:1 program to reset my metabolism this time. Remember how I said that I didn’t want to eat only twice a day? I did something about it. I divided my meals into 4: breakfast, lunch, snacks, dinner. In preparation for my first fast day, I bought two recipe books specifically for this. One was Diana Clayton‘s and the other was by Mendocino Press. Here are some of the stuff I ate and made during fasting. 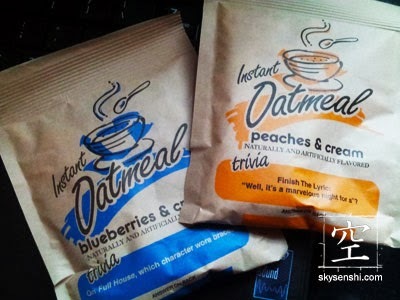 Breakfast: Sunny Select Creamy Fruit Instant Oatmeal (blueberries and cream variant), available in Rustan’s groceries. 120 calories. It even has some pretty nifty trivia. Then I follow this up with something warm. I’d usually go for Kopiko’s Low Acid coffee (139 calories) but I needed to go lower without damaging my stomach lining. Mr. Brown Blue Mountain Blend Coffee is 69 calories but that would burn a hole in my stomach and render my food spacing ineffective. I went for Green Max Green Tea Au Lait instead. It’s 90 calories but at least it didn’t leave me feeling like I needed to eat in the next hour. Both Mr. Brown Coffee and the Green Tea Au Lait are available at the Asian grocery behind Burgundy Corporate Center in Buendia. I had many options for lunch. One of them was a couple of stuffed mushrooms. 135 calories. Recipe here. These mushrooms were supposedly filling, but they didn’t feel substantial to me. I searched for other recipes that were filling but stayed below 100 calories instead. Like this 90-calorie garlic chicken. Recipe here. Now snacks are my favorite part of the day. 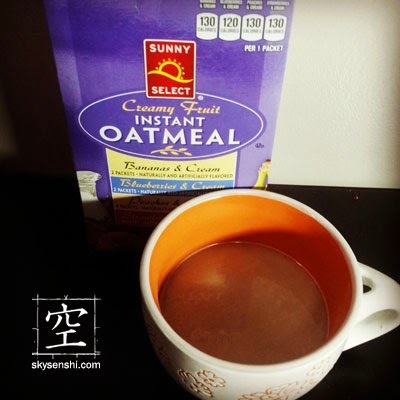 I’ve found smoothies and pancakes that ranged from 50-160 calories over at the Yummly website. Like this banana bread smoothie. At 110 calories, this is so very filling. And man, it’s delicious! Depending on what I had for lunch, I’d pick a snack with lower calories. One reason why I like the Yummly website so much is that it not only provides you with quick recipes, it also allows you to search based on calorie count. Anyway, for dinner…well, I actually discovered these no carb noodles called Shirataki. They can range from 5 to 20 calories per bag, depending on the brand. Vegetable pasta soup. 88.5 calories. Got the recipe from The Miracle Noodle Cook Book. You can buy these at Healthy Options (expensive!!!!) or any Asian grocery. I got my bags from a grocery in Little Tokyo (near Makati Cinema Square) and it costs around P50. I heard that if you buy it from Choto Stop, it costs P80. A lot of Westerners find the noodles to be an olfactory offense, but being used to eating smelly food like dried fish and durian, I find their reaction funny. I simply rinse the noodles with water and lemon juice and I’m done. This is best cooked Asian style. I tried cooking it Italian style and it was just plain gross. Think of it as no carb pancit noodles. Shirataki is made of konjac yam and has a gelatinous texture. Basically this is water-soluble fiber, has no gluten, no nutrients and has very little flavor so you will have to get the nutrients and flavor from the ingredients you mix it with. Anyhoo…that’s basically what I did to lose weight. I actually enjoy planning my meals for the fast day BUT I highly doubt that I’d enjoy it as much if I had to plan my meals and count my calories every day. Once a week seems to be the best trade off for me. I get to eat whatever I want for 6 days, and for 1 day, I eat super low-calorie meals that I prepared myself. I picked Sundays because that would force me to rest and do nothing but read or play video games. It also minimizes my walking, to allow my feet to heal. That’s about it for this post. Next time, I’ll discuss about my gradual change in foot wear. I really believe in moderation. I've been telling the husband that he doesn't have to starve himself if he wants to lose weight. Same with his diabetes. He can eat whatever he wants, as long as it's in small doses. Like instead of eating one whole Cadbury bar, he can have 1 square instead. Unfortunately, moderation isn't in his vocabulary. He also has this mentality of feeling 'kawawa' when he has to control what he eats. Kind of annoying actually, haha! Yep. I believe in portion control as well because I hate counting calories. And I hate being hungry, kaya even on fast days, I look for meals that are low-calorie but are filling and I spread them out. Many people kasi who are on the 5:2/6:1 just drink coffee in the morning (skipping breakfast) then eat lunch and dinner. I cannot do that. OMG, I swear I could turn vampiric/cannibalistic if I did that. Tsaka coffee in lieu of breakfast = high acid levels = ulcer + bad breath. Not good. I also use a BMR calculator to understand my body more. Important yung low GI carbs. You get energy, they burn slower, they also keep water weight down. I don't stay away from fat, though. I don't know how people can skip breakfast, too. If I don't eat breakfast before doing anything, I feel really dizzy and weak.